Last year I linked to a Maple-Miso Tofu recipe in one of my What I Ate This Week posts and shortly afterwards, the recipe disappeared from the internet. I have no idea why it was taken down, but I get people asking me once in a while if I happen to have a copy of it myself and sadly, I do not. I get asked about it enough that I figured I’d try to make my own version and post it here. Then I decided that what would make that Maple-Miso Tofu even better was to serve it in a bowl full of noodles. A noodle salad! With chewy baked tofu and maybe an almond-lime sauce, like the one I made a few months ago to dip crispy baked zucchini in. I was all set to make that, until I decided what would be even better would be to make the Maple-Miso Tofu and then serve it in a regular, non-noodle salad with an almond-lime dressing. But right before I went to the kitchen to start cooking, I realized making two separate sauces would be a little bit of a pain, so I merged the two together and made an Almond-Miso Dressing that works for both the tofu and the salad. Sorry Maple-Miso Tofu, I will have to tackle you another day. 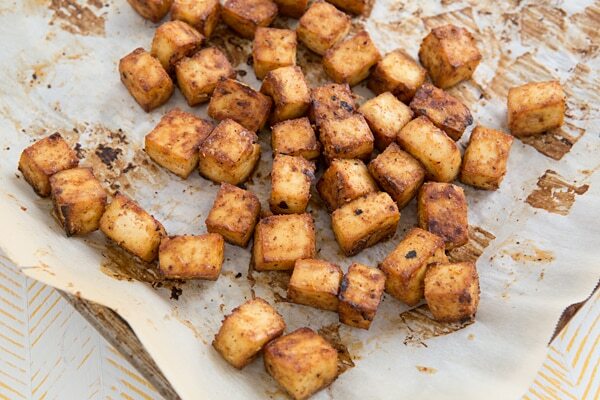 When you bake tofu with a sauce, it’s best to use a conservative amount because any excess sauce on the baking sheet will blacken and burn. Tossing the tofu with two tablespoons of sauce might not seem like a lot and it’s not, but it’s the perfect amount to coat the tofu before you bake it. After the tofu is finished baking, you’ll toss it in another tablespoon of the dressing, which kicks up the flavor. With tofu, almond butter, cashews, and hemp hearts , this salad is full of protein, while all the fresh veggies add lots of fiber—that’s what makes this a chopped power salad! It’s a salad that will keep you full and satisfied. And did I mention it’s delicious? Because it’s that too. 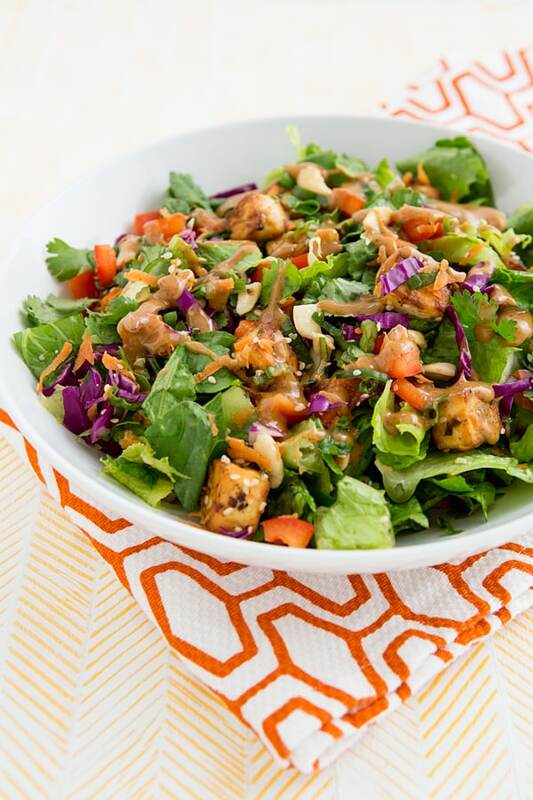 The sweet, nutty dressing tastes a little bit like Thai peanut sauce–you will want to put it on everything you eat! Customize this Chopped Power Salad with whatever veggies you have on hand, but don’t skip the baked tofu–it’s the best part! The dressing recipe makes just enough to coat the salad without any extra. My husband thought this was perfect, but I’m a little bit of a dressing fiend, so I like more on mine. If you’re like me, you might want to double the dressing recipe. Any leftovers you have will last in the fridge for at least a week. I really like the sound of this salad – it’s so full of great flavours and textures and that almond/miso dressing sounds totally out of this world. I’ve always wondered what the heck you do miso paste. Me thinks it’s time to dive in. Oh, so many things! Even just stirring it into a bowl of broth and adding veggies to make miso soup is delicious. It’s another name for hemp seeds. They’re high in protein, so they’re great to add to salads, smoothies, homemade granola bars, etc. Talk about healthy in a bowl! I’ve been meaning to get miso, so this gives me the perfect excuse to go to Whole Foods again 🙂 What’s your fave brand of miso? Someone found the recipe and emailed it to me! So I have it now. 🙂 Let me know if you still want it! yes!! I would love the recipe! I started doing a lazy version of this recently with packaged Asian salad mix. I can’t wait to give this dressing a try. Tofu baking hack: Parchment paper is key for easy clean up! i laugh because I’m reading this over a dinner of baked tofu and stir fried broccoli ! This looks great! I’m so obsessed with baked tofu. I can’t wait to try this dressing. Sounds delicious!! A fantastic salad, Kiersten. Can’t wait to try your miso dressing! This looks great Kiersten! Chewy tofu over lots of delicious veggies and a mighty sauce sounds like my ideal meal. Yes, I would very much enjoy a copy of the Maple Miso Dressing. Thank you for all the work you do!! My daughter and I are just entering the world of vegan….she’s a couple of steps ahead of me. I just emailed it to you! Good luck with going vegan–my mom went vegan last year and while it was a big adjustment at first, she found it to be much easier than she thought it would be! Definitely a power salad! I love miso and this dressing sounds amazing. Love the hemp hearts. Can I ask you please, what are your thoughts on Tofu/soy as a GMO? I try to avoid GMOs when I can, but I’m realistic about it–if I go to a restaurant or eat at someone’s house, I’m probably going to eat GMOs. I just believe in doing the best you can. When it comes to soy, I’ve never had a problem finding GMO-free tofu, tempeh, etc. It makes me sad when people say they don’t eat those things because of GMOs, because there’s a common misconception that all soy products are GMO! My little local grocery store only sells Nasoya tofu, which is GMO-free, and large natural food stores like Whole Foods have a lot of additional options. They do! I love salty-sweet salad dressings. Love the look of this! It’s going on my list of things to make! This looks truly yummy! Not to mention how inviting it looks, thanks to those vibrant colors! That salad looks yummy! Definitely want to try soon. FYI, cookbook author Lorna Sass has a Maple-Mustard-Miso Tofu recipe that is excellent. It’s in her “The New Soy Cookbook” and might have been the one online then pulled: 2 T shoyu, 2 T dijon, 1 T white miso, 1 T maple syrup, 1 T toasted sesame oil. I like it! A power salad to power you through the day! That dressing sounds amazing- definitely giving it a go! And I agree; baked tofu is where it’s at! After making my power salad last week, I am definitely into continuing the trend with this salad this week!! I love the sound of that dressing…miso and I are BFF lately! Power salads for allllll! We will conquer the world! That disappearing act happened to me on another recipe I intended to try. One of these days I’ll get it together and save hard copies of recipes. I remember making that Maple Miso Tofu for a good stretch until I got tired of it, and I’ll be excited to try Almond Miso Tofu. Yeah, now that Pinterest exists, I pretty much never save recipes any other way now. I used to print everything! Yum!!!! I’m so into miso + Asian flavors lately–can’t wait to try this. Like ASAP. Also, I hate losing recipes >((( Nothing makes me grumpier. I made the BEST incredibly fudgy dark delicious chocolate-y cookies last Christmas thanks to Pinterest and now that blog is GONE. So sad!! I absolutely love the colours, textures, and flavours in this! I just came back from a conference in Seattle where all I could eat was restaurant/take out food so now all I’m craving is salad! I love salads like this that are actually filling while still super good for you! I love a giant salad for dinner, but it’s so much more exciting when it’s full of different ingredients and textures like this one. This salad looks like it strikes the right balance between filling you up with protein but also leaving you feeling light and energized. Sounds delicious too! Made this recipe this week- only change I made was to use massaged kale instead of romaine. It is DELICIOUS! And quite a lot more filling (and that feeling lasts longer) than I expected. Perfectly used up the last of some almond butter i had been wondering what to do with. Thank you! I’ve been perusing your site for a while and am just now beginning to use it as my main source of dinner inspiration. So far so good! I would love the recipe for the maple miso tofu!